Looking for More Information on Mobile Advertising? Explore Smaato’s resources section to help you easily integrate and monetize your app or mobile website. Learn more about Smaato’s innovative mobile advertising formats that drive revenue and engagement. Our partners share how we’ve helped them maximize their mobile advertising fill rates and eCPMs. Gain insight into the factors required for organizations to ensure GDPR compliance. Learn all about the trends, tools, and tips for maximizing campaign performance through in-app advertising. We focus on helping publishers drive app revenue while protecting users from harmful ad experiences. We combine human expertise with sophisticated technology to create a safe and secure platform for advertisers. Our ad exchange is connected to 260+ DSPs and 190+ ad networks, giving publishers access to global demand. 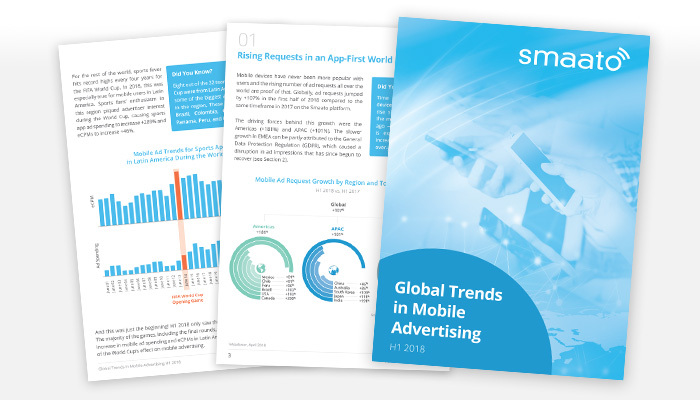 Our reports analyze ad impressions on the Smaato platform to uncover the most current mobile advertising trends. Download our lightweight and easy-to-use SDKs for the easiest and most powerful integration. View a collection of videos to learn more about Smaato, including products tutorials, interviews, and more. Get insider tips on how to optimize your advertising setup and learn more about best practices for mobile monetization. Gain insight into the mobile advertising industry and discover best practices for optimizing your mobile ad strategy. The Smaato Wiki includes valuable technical documentation, frequently asked questions, and more.